If you’re producing a podcast of your own, you’re likely a writer, journalist, or subject matter expert with great ideas and stories but working with a small budget. Poor audio quality can detract from the message that you’re trying to deliver, so it’s important to get great-sounding, compelling audio. With a few simple steps, you can vastly improve the sound quality of your podcast—without buying any new equipment or software. Here are are some podcasting audio production tips to help get you the best possible sound. 1) Find a quiet room with plenty of space around you. Whenever you start recording with a microphone while reading from a script or capturing an interview, think about things in your environment that might make noise. Is there a fan on your computer? Can you hear mouse clicks as you scroll through your script? What about page turns? Refrigerators? Cell phones? Cats? Dogs? Birds? Use headphones to monitor your recording. Turn them up to listen to what the microphone is hearing before you start your delivery or interview. Try to minimize any extra noise as much as possible. A cleaner recording will be easier to handle later on in the process. It’s also important to think about the acoustics of the space you’re in. Hard, flat surfaces reflect sound like a mirror reflects light. Leave space around you and your microphone to minimize early reflections. Set up on a carpet, near some bookcases, and away from walls. Also avoid reverberant spaces. Some offices, classrooms, conference rooms, and huddle spaces can be especially reverberant. Reverb is hard to remove after the fact (the De-reverb module in RX 6 Advanced makes it much easier), but easy to add later on if you need it for some particular effect. 2) Experiment with indirect microphone placement. Plosives, the burst of air that exits the mouth when we make “P” and “B” sounds, are like giant gusts of wind to a microphone. To help mitigate these, avoid talking directly into the front of the microphone and use a windscreen or pop filter when possible. Set your microphone up slightly to the side so those bursts of air don’t go directly into the diaphragm. Don’t set it up at too extreme of an angle, though, or you’ll be talking into a null in the pickup pattern of directional microphones. You should notice a much more natural sound for your voice. Experiment with your microphone placement and capture test recordings to find what sounds best for your voice. Many broadcasters and voiceover artists stand when recording to help provide better air support and a strong, confident read. This can also help mitigate early reflections caused by a desk. If you do need something to hold your script, a music stand works well. Consider placing a piece of foam or a carpet sample on the music stand behind your script, to avoid early reflections. 4) Be conservative with your levels. Most audio interfaces and recorders need you to set an input level for your microphone. Since the advent of high-quality digital recording, there’s really no reason to set input levels too “hot.” You can always make things louder later on. To set a good, modest input level, speak at a normal-to-loud speaking voice and aim to make this level around -20 dB, or about halfway up on most meters. Then test with a hearty laugh or emphatic phrase to make sure the level never peaks above 0 dBFS or goes “into the red.” If you’re worried that it might, just turn it down and be conservative. 5) Record a high-resolution audio file. Compression artifacts compound over time, so make your initial recording with a high-quality WAV or AIFF file. However, there’s really no need record a file at any resolution higher than 24 bit, 48 kHz. With high-quality source material, even if your recording goes through a data compression codec (like MP3 or AAC) for distribution, it will be starting from the best possible source material. 6) Make a test recording. Before recording an entire podcast, make a test recording first. Or listen back to a previous recording and compare it to other podcasts that you enjoy. Listen to your test in the environment you expect your listeners to be in, like a bus, subway, or car, and on multiple listening devices, from earbuds to high-fidelity headphones. Take some notes on what you might improve. Does your read trail off at the end of phrases? Is there a lot of background noise or mouth noise that you might want to remove? You can also use this test recording to get feedback from trusted colleagues, both on the content and sound quality. You might even send it to one of your favorite podcast hosts and see if they’ll give you some feedback (and perhaps a mention in one of their podcasts or social media channels!). 7) Work from an outline or script, and take time to get a great delivery. No matter how nice your microphone is, there is no substitute for a confident read and great content. There are only a few professionals with the innate ability to do it live. Editing a script is much easier than editing audio, and gives you the advantage of having all your great ideas laid out in a text format that could be used for something else, like a transcript (extra credit for timestamps), blog post, or even a book down the road. Obviously, you can’t script interview segments and co-host interaction. 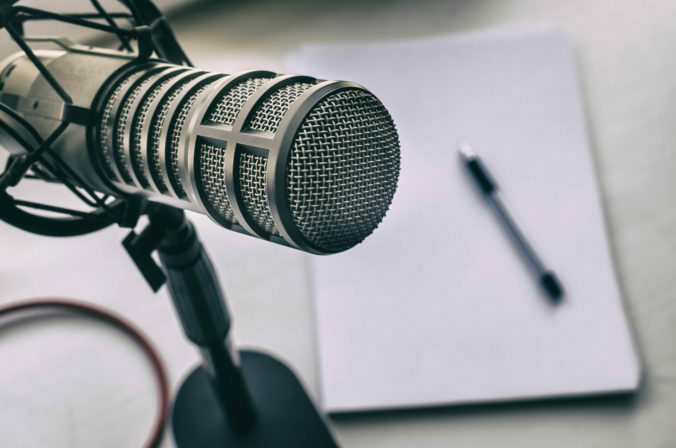 But having a solid outline with your introductions, questions, transitions, and closings prepared can help make for a smooth podcast, and show your guests that you’ve done your homework and are prepared and professional. It can also be helpful to give your listeners an outline of what you’ll be talking about up front, and a summary of takeaways at the end. This can set the context for your episode and wrap it up nicely—a great idea for presentations and pitch meetings, too! 8) Record remote guests and co-hosts separately. When working with guests and co-hosts who can’t be in your studio, you can turn to VoIP services, like Skype or Google Hangouts, or the telephone. The audio quality is not always the greatest, but it’s easy to record great audio in both locations and then merge them together later. Just ask your remote guest to record a high-quality WAV/AIFF file of only their voice that they can send to you later. If they don’t have a microphone and podcast setup themselves, just making a local recording with their computer microphone or into an app on their mobile device can provide superior sound quality to what you would get through VoIP or telephone. Conduct your two-way communications for the interview recording through the traditional channel, but then get their recorded audio after the fact and combine it with your recorded audio. 9) Leave time for edits. When scheduling your podcast for recording and deployment, be sure to leave time for a careful edit and QC (quality control) of your entire piece. The listener’s time is precious, so make your message clear, concise, and professional. Limit dead air, remove duplicated topics, and fix the occasional “um,” “ah”, and false starts. Editing can be overdone, however, so challenge yourself to get the best possible read in one segment. You don’t want to edit the audio to death, but brevity is always appreciated by listeners! 10) Use a modest amount of EQ and compression. A high-pass filter only allows sounds above a certain frequency to pass through. Everything else is filtered out. Because most speaking voices don’t generate any fundamental frequencies below about 85 Hz, you can set a high-pass filter around 80-100 Hz to help remove rumble and plosives that your listeners won’t want to hear anyway. A bit of equalization can help compensate for resonances in your room, or certain frequencies that might seem to stick out when you hear your voice through your microphone. It’s generally best to cut frequencies rather than boost them. Be aware of using extreme boosts or cuts of more than 6 dB. They may sound good on your headphones or speakers, but may be too extreme on a different set of headphones. Compression takes louder sounds and turns them down slightly whenever they happen, to even out the differences between loud and quiet words or sections. After compressing these louder sounds, you can turn up the overall sound of your voice, making everything seem louder overall. This can be helpful when people are listening to your podcast in noisy situations like a subway, car, or bus. This is another effect that shouldn’t be used to extremes. Start with a ratio of 2:1 and lower the threshold of the compressor until it activates only on the loudest sounds.